Five years after the U.S. backed a disastrous Ethiopian invasion of Somalia, Washington is considering supporting another ill-conceived incursion into the war-torn East African nation — this one by neighboring Kenya. Meanwhile, the U.S. has escalated its drone campaign against Somali insurgents, apparently coordinating the aerial strikes to take advantage of the Kenyan advance. If Ethiopia’s experience in Somalia is any indicator, the Kenyan invasion could quickly backfire. A popular backlash against the Kenyans could set Somalia back by years, and undermine recent U.S. efforts to craft a strategy for Somalia that balances surgical counter-terrorism and strong support for the embryonic Somali government. In 2006, Ethiopia invaded Somalia and occupied the country, Uganda and Burundi sent peacekeepers to Mogadishu in 2007 and since 2008 more than a dozen nations have deployed warships to patrol for Somali pirates. Through all this, Kenya played only a background role, allowing naval vessels to refuel and resupply in its harbors and playing host to a small contingent of U.S. Special Forces launching periodic raids on al-Shabab, the main Somali insurgent and terror group. That all changed in recent weeks as al-Shabab agents sneaked into Kenya and kidnapped several aid workers and tourists, including a cancer-stricken French woman who later died. Last Sunday Kenya sent troops, helicopters and jet fighters into southern Somalia, vowing to punish al-Shabab. France provided logistical and air support, continuing its tradition of lethal retaliation for Somali kidnappings. The Kenyan assault caught the U.S. “on its heels,” one American official told The New York Times. The official said Kenyan authorities provided “zero” information to their U.S. counterparts before the attack began. 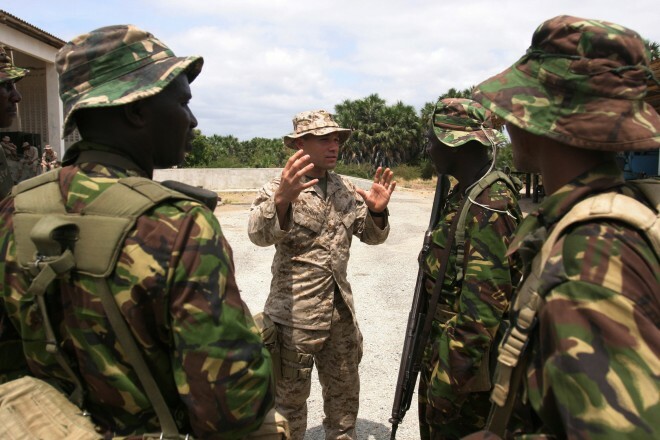 But a week into the offensive, Washington was tentatively offering support, in apparent acknowledgment of America’s historically close ties to Kenya. “We are talking with the Kenyans right now to figure out where they need help,” said Scott Gration, the U.S. ambassador in Nairobi. In any event, U.S. counter-terrorism agents were apparently already taking advantage of the disruption caused by the Kenyan invasion. With al-Shabab fighters flushed out into the open, on Wednesday an American drone apparently attacked, killing as many as 46 insurgents. (U.S. officials have denied any American air strikes took place — a claim Kenyan officials reject.) The U.S. used a similar tactic during Ethiopia’s 2006 invasion of Somalia, striking insurgents as they fled Ethiopian tanks. The fledgling Somali government, whose troops are trained by U.S.-paid mercenaries, also took advantage of the Kenyan offensive to launch an operation of its own. But that doesn’t mean Somali president Sharif Sheikh Ahmed is thrilled about the latest attack on his country. “The Somali government and its people will not be pleased with Kenya’s intervention,” Ahmed said. And the escalated U.S. drone strikes do not mean that the Kenyan attack is ultimately beneficial to U.S. efforts in Somalia — especially if the incursion metastasizes into a long-term occupation. The Ethiopian invasion and occupation between 2006 and 2008 provoked a major backlash that empowered al-Shabab and persuaded Washington that a more hands-off approach to Somalia was preferable. The U.S. “shadow war,” involving drones, Special Forces, mercenary trainers and logistical support for peacekeepers, deepened as the Ethiopians retreated — and by early this year appeared to be making a real difference in Somalia. Al-Shabab leaders were dropping like flies. And Ahmed’s forces along with the peacekeepers — both with U.S. support — managed to force insurgents out of Mogadishu. But those American efforts to wage war in Somalia quietly, on the cheap and through the right proxies could be threatened by this Kenyan incursion. There is already evidence things are turning. One person has died and 23 have been injured in two grenade attacks in Nairobi in the past week that have been blamed on al-Shabab. If the terror attacks draw Kenya into a self-defeating occupation that the U.S. feels compelled to support, the Somali conflict could get bloodier … and even more difficult to resolve.